The Rust Belt gave Trump his victory. Now these voters want jobs. Cathy Paraggio always checks the labels on stuff she buys: Is it made in China? Vietnam? Bangladesh? Mexico? Or America? She was a big believer in the "Made in the USA" movement long before President Trump started telling the nation to "Buy American and hire American." In 2012, Paraggio launched a male swimsuit brand called NoNetz. It makes swimsuits that prevent chafing and rashes. Paraggio vowed to make the suits in the U.S. She found a textile factory in Brooklyn, MCM Enterprise, that could do the work. There was just one problem: The suit cost $23 to make in Brooklyn. Making it in China and shipping it to Paraggio's office cost a mere $10. Manufacturing in America "makes me look like a bad business person," Paraggio told CNNMoney. She went with the Brooklyn option anyway. Surely, she thought, customers would prefer to see the "Made in the USA" label. "No one cares about Made in the USA," says Paraggio, who recently ordered some suits from China for the first time after Daymond John of Shark Tank gave her frank advice to get real about the bottom line. So she placed the order. And cried. Trump preaches "Buy American" often. He mentioned it in his Inaugural Address. He brought it up in his first prime-time speech to Congress (watched by over 47 million people). He made it a campaign issue. But the largest obstacle to Trump's vision may be the American shopper, who is constantly on the lookout for a good deal. In survey after survey, Americans say they prefer to buy "Made in the USA" products. But when it comes to actually spending, their choices tell a different story. "Consumers are all for Made in America until they have to pay for it," says Greg Portell, partner at consulting firm A.T. Kearney who specializing in advising retailers. People have grown accustomed to cheap prices after years of shopping at discount retailers like Walmart (WMT) and Target (TGT). In general, they only buy American if it doesn't cost much more than the product from China or Germany or Bangladesh. Paraggio saw this trend first-hand in her business. She gets two frequent comments from customers: They love the product, but why does it cost so much? An Associated Press-GFK poll last year found nearly 75% want to buy American. But their first preference is to buy the cheaper item. The Boston Consulting Group, which has studied the issue for years, found it's a bit more complicated. When people go to the store, they also consider quality. Eighty-five percent of U.S. consumers think American-made products are better quality than those made overseas, BCG found. And they are willing to pay a premium for some products that are Made in the USA. For baby formula they'll pay a lot more. For shoes, they won't. "Clothing is one of the things that is very hard to reshore. It's a tough road to go," says Hal Sirkin, a senior partner at BCG. Overall, BCG estimates companies can charge up to about 5% more for American-made. Trump certainly understands this labor math. Some of his own clothing line is made in China. 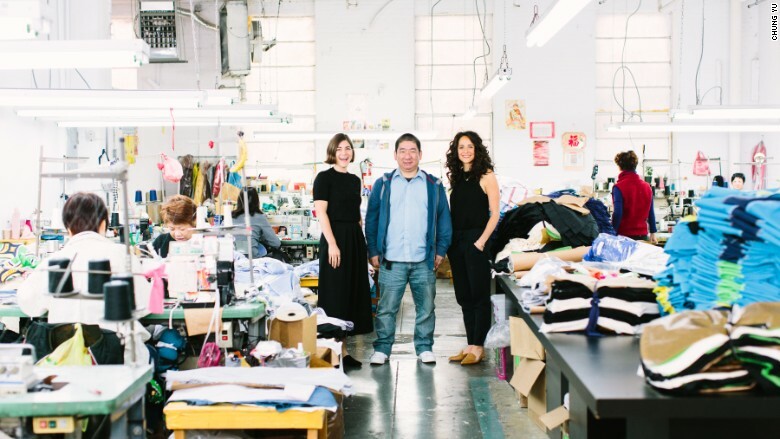 Chung Yu owns the factory in Brooklyn where Paraggio has been manufacturing the NoNetz swimsuits. He's been in garment-making for 35 years, but he's worried about staying in business at a time when New York has raised the minimum wage. It New York City, employers who have a staff of 11 or more, have to pay $11 an hour. That will go up to $15 an hour by the end of 2018. "In China, it's $2 or $3 an hour. And even China is getting too expensive. Retailers are switching to countries like Bangladesh," Yu explains. Yu's factory is still pretty busy, but it's almost all small orders of about 300 items or less. Most of his clients are small businesses like NoNetz. As soon as they hit a certain scale, they typically jump overseas for production. "People think Made in America is better quality, but that's not true," Yu says, frankly. "It all depends on the quality of the machines and labor." Yu won't say who he voted for, but he says thanks to Trump, everyone in his world is talking about "American made" again. "When we hear how Trump will bring manufacturing back, we're excited," Yu told CNNMoney. "But we have to see how he will implement it." Chung Yu owns MCM Enterprise, a clothing manufacturer in Brooklyn. What could come back to the U.S. There's a lot of debate about whether Trump can bring manufacturing, let alone manufacturing jobs, back to the United States. Robots and automation have also taken some (if not a large part -- Ball State University says 88% of manufacturing job losses come from automation) of the jobs. Experts say it's going to take more than a "buy American" promotional campaign to make it to happen. The research BCG has done suggests that some industries are more ripe to come back to the U.S. than others. The reality is wages have been rising in China and elsewhere in the world, making it less attractive to make certain products there. "Computers and appliances are at a tipping point," Sirkin says. "We've seen manufacturing costs overseas go up for those industries." Clothing, however, is one of the least likely processes to return, BCG found. "How could you possibly buy shorts for $5 and have it made here. You absolutely can't. I've tried," laments Paraggio.